A trivial bit of information about British novelist, author and playwright J.B. Priestley is that his birth and death dates are mirror images — 1894 to 1984. There is no ulterior meaning to this, other than the fact that he’s a writer who was fascinated by unusual twists of fate and made them a part of his playwriting. He loved uncovering the reality behind the façade people present to the outside world, instead of simply and plainly offering the truth of who they are — which is rarely plain or simple. Priestley’s plays — Time and the Conways, Dangerous Corner, An Inspector Calls— are fine examples of this preoccupation, which he handled with great skill. They were sleek, entertaining, smart and, most important, intriguing. He knew how to grab an audience and never let go. He also knew how to come up with endings that often left an audience in a deeper quandary than at the start. So his writing was — and still can be — captivating and deliciously tortured stuff. 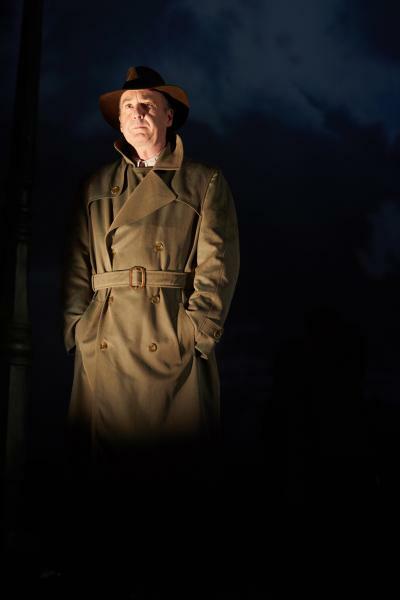 Liam Brennan as Inspector Goole in An Inspector Calls at the Bram Goldsmith Theatre of the Wallis Annenberg Center for the Performing Arts. For all these reasons, it is disappointing that the excellent director Stephen Daldry (Billy Elliot, The Hours, The Reader, The Crown) who had staged an earlier and well-received version of An Inspector Calls in Britain more than two decades ago, winning a 1994 Tony Award for it as Best Director, chose to send out an odd retread of it on tour. This reconstituted version, billed as The National Theatre of Great Britain’s Landmark production of An Inspector Calls, is now playing in the Bram Goldsmith Theatre at The Wallis Center for the Performing Arts in Beverly Hills. I did not see Daldry’s 1992 staging that made such a big impression, so I cannot say how much may or may not be different in the one now at the Wallis. But Priestley’s plot as written cleverly provides all of the mystery, convolutions, and suspense an audience needs to become fully engaged. We know times change, yet the folderol of the extreme stylization in this iteration is a bit of a head-scratcher, mainly because there appears to be no clear advantage to it. Without giving away too much information, the point of the 1992 original was apparently to show up the callousness of capitalism and capitalists. Unless you know this, the presence of the three young ragamuffins who open the show, playing around with the heavy red velvet curtain on stage, is a bit puzzling. So is the fact that, just like poverty, these children serve no real other purpose and also never leave the stage. 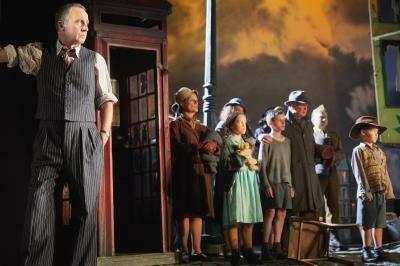 Foreground left, Liam Brennan with the cast of An Inspector Calls at the Bram Goldsmith Theatre of the Wallis Annenberg Center for the Performing Arts. Once that curtain rises, and the stage fog behind it lifts, we discover a house on stage from which laughter emanates. The house is small and it has a small balcony. When Arthur Birling (Jeff Harmer), the self-important head of this affluent household emerges on it, he has to bend down slightly to fit though the door. So does anyone else who joins him there. The point? Egos so large, apparently, that no house is big enough to accommodate them. Thanks to designer Ian McNeil’s magic, the little house opens up to reveal the rest of the Birling family — mother Sybil (a commanding Christine Kavanagh), son Eric (Hamish Riddle) and daughter Sheila (Lianne Harvey) — all sipping port around a table in the tiny, slightly tilted dining-room. They are celebrating Sheila’s engagement to Gerald Croft (Andrew Macklin). Aside from uniting Sheila and Gerald, this union will consolidate two major family businesses. What perfection. But suddenly there is a knock on the door and Edna, the maid (Diana Payne-Myers), announces that there is a police inspector who wants to talk with Mr. Birling senior. And so the play begins. It seems that Inspector Goole (Liam Brennan) has significant questions that can’t wait. We won’t go into why he believes they’re urgent. It would spoil the fun of finding out. The actors are skilled and seasoned, even if they’re sometimes hard to hear, especially the women. (Sebastian Frost is credited with the sound, but in fairness to him, previous experience with the acoustics of the Bram Goldsmith Theatre suggests those acoustics may be part, if not all, of the problem.) That’s important to correct, because everything in this play depends on our ability to follow the conversations. We need to find out why Inspector Goole has disrupted this little party and wants to talk not just to Arthur Brilling, but to everyone in the room. 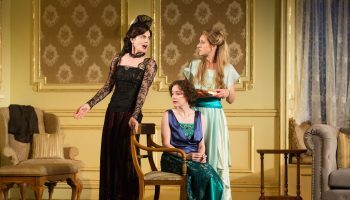 Foreground, l-r, Chritine Kavanagh & Lianne Harvey in An Inspector Calls at the Bram Goldsmith Theatre of the Wallis Annenberg Center for the Performing Arts. Daldry has done a fine job of condensing the play’s original three acts into a single one, eliminating the intermissions without missing a beat. But the matter of the small house, which plays a few more tricks of its own, the unaccounted for children and the rest of the collapsing wizardry (more symbolism there), rather than adding to the metaphysical edge of the piece merely muddy and overstate it. Messing with a mystery written with such precision and such a chiseled metaphysical dimension seems a bit pointless, if not self-defeating. Or self-aggrandizing. Priestley did a fine writing job and knew exactly what he was after. That script intact has aged well. It speaks for itself. Daldry’s augmentations, however well intentioned, overgild the lily. It’s a bit like serving an excellent steak dinner needlessly topped with sausage. Top image: The fog that lifts to reveals the little house in J. 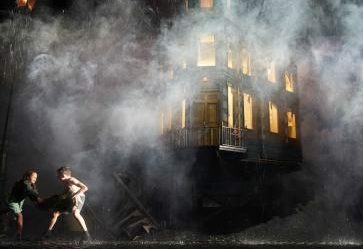 B. Priestley’s An Inspector Calls at the Wallis. 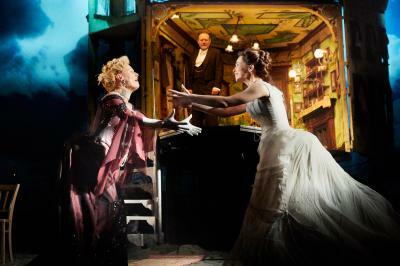 WHAT: AN INSPECTOR CALLS, The National Theatre of Great Britain’s Landmark production of J. B. Priestley’s Classic Thriller. WHERE: Wallis Annenberg Center for the Performing Arts, Bram Goldsmith Theatre, 9390 N. Santa Monica Blvd., Beverly Hills, CA 90210. 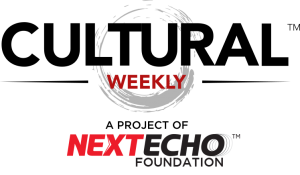 WHEN: Tuesdays-Fridays, 7:30 pm; Saturdays, 2 & 7:30pm; Sundays, 2 & 7pm. Ends Feb.10. RUNNING TIME: One hour, 45 minutes. 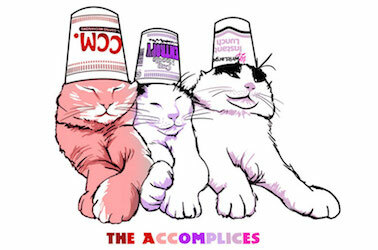 The following is a recollection and a comment. In 1987, I reviewed Lee Blessing’s A Walk In the Woods at the La Jolla Playhouse. It consists of a series of walks and talks in the woods, by two diplomats, an American and a Russian, charged with negotiating an unspecified arms deal. It was directed by Des McAnuff, the Playhouse’s Artistic Director at the time. Lawrence Pressman played the American John Honeyman and Michael Constantine was the Russian Andrey Botvinnik. But the ultimate star was and is Blessing’s script — a bracing example of a two-way conversation that goes nowhere and yields nothing other than a thoroughly engaging evening in the theatre. 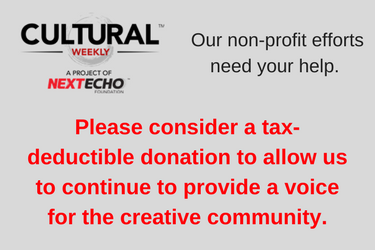 The takeaway: Theatre does not necessarily take a village. At its core, it is not about over the top production values, but naked human artistry. Thirty-two years later, the brittle cleverness of A Walk In the Woods is undiminished — a stark reminder that a series of imaginative short scenes, with two fine actors, a knowledgeable director and minimal projections of trees transformed by the changing seasons can be all you need — and everything it takes — to deliver exciting theatre. Blessing’s dialogue is an elastic verbal tennis match, proving that even circuitous and inconclusive conversations will hold your attention if the writing is inventive enough and the actors know exactly what to do with it. I worked on this at the O’Neill Conference in the 1980s (playing Honeyman) and remember Lee Blessing saying, “The play works best when the two actors like each other.” That was the case with the late-departed Merwin Goldsmith and me, and it’s a happy memory. Later, with a major movie star, it was a rockier road.